toys, banks and even cigars. But the general impression it gave was just an early example of comics trading on the popularity of Little Nemo in Slumberland, and, having predated Nemo by four years, it wasn't. The cartoonist who created it, however, made it notable indeed. W.W. Denslow, whose illustrations in L. Frank Baum's The Wonderful Wizard of Oz (only tenuously related) are considered by many to be as important a part of the story as Ernest H. Shepard's in Winnie-the-Pooh or Sir John Tenniel's in Alice in Wonderland, made Billy Bounce his first major work following his 1901 split with Baum. According to available sources, Billy started November 11, 1901. But that was a Monday, and it isn't known to have appeared as a daily. Whenever, precisely, it began, it was soon distributed nationwide by McClure, one of the oldest syndicates in newspapers, whose later offerings included Bobby Thatcher and King Aroo. Billy had another distinction — a super power, which, according to comics historian Brian Walker (son of the creator of Beetle Bailey, among others), made him one of the earliest super-powered characters in comics — possibly the first. His ability didn't exactly put him in a class with superheroes like Green Lantern or The Flame, but it was still a genuine super power. Like Bouncing Boy of The Legion of Super Heroes, he could bounce just like the rubber ball he closely resembled. In some cases, what he did resembled floating or even flying under power, but he could launch himself into the air and accomplish a reasonable amount of mischief thereby. Even as minor a power as that made him, according to comics historian Jerry Robinson (better known as an early Batman artist) "a precursor of the comic book Super-boy" (hyphen is Robinson's). What Billy generally used his power for was playing mean tricks on his supporting characters — not that they treated him any better! That was a major source of such humor as the feature had. At first, his associates included Fuzzy White (a bear who managed twin lion cubs), Prunes the Pieman (who masqueraded as a wild pieman from Borneo in early episodes), the Wild Red Cigar Indian, and other denizens of the circus in which he performed as a clown. By 1905, they'd faded from view, and he mostly hung around The King of the Pollywogs, who resembled a humanoid with goat characteristics, plus antennae. By that time, Denslow had long since moved on to other projects. His replacement, as of August 3, 1902, was C.W. Kahles, already a veteran artist in comics. 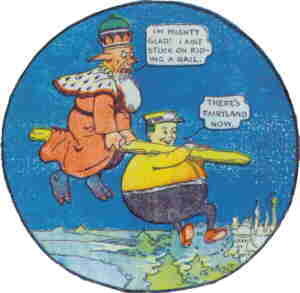 Kahles had been responsible for Clarence the Cop, believed to be the first strip about a policeman, but is most famous as the creator of Hairbreadth Harry. But Denslow returned to the character in 1906 (which, incidentally, is the year of the comic's demise). Donohue & Co. brought out a novel-length text story about Billy, with 15 color plates by Denslow. The writer's name was Dudley A. Bragdon, but such was their relative fame. Denslow's name appeared above Bragdon's on the cover. The book remained in print for a few years, at least, and still elicits interest from Denslow's fans. But that was the last of Billy Bounce. Text ©2007-10 Donald D. Markstein. Art: Billy Bounce is in the public domain. This image has been modified. Modified version © Donald D. Markstein.